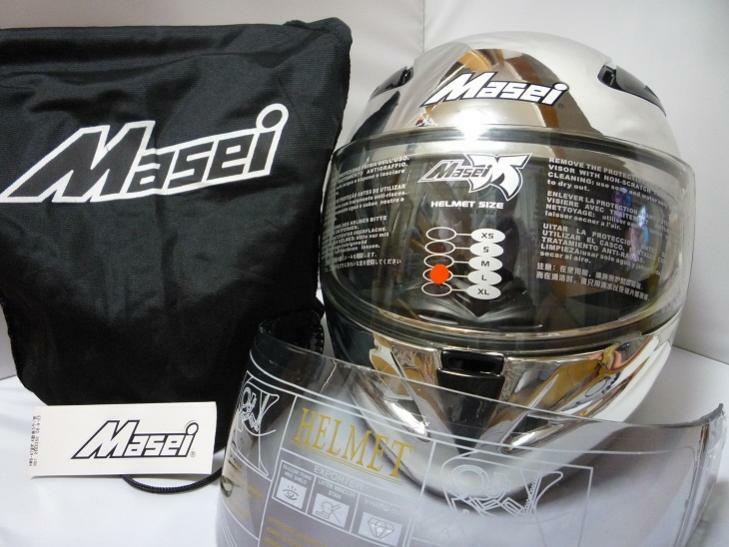 good price for that masei helmet, but cheek pad is too tight. I bought one in ebay and like it, but the cheek pad is very firm and tight at first. After about a month, they feel like they've loosened up a bit. I would have rated masei flipup higher except that the flip visor feature needs some re-working regarding the mechanism. It flips down OK using the side-mounted activator, but getting it back up is really hard; it's "stiff" at best. I find that I have to open the main visor and use a finger to push up on the bottom edge of the sun visor to get it to move up easier. The flip sun visor is one of the main reasons I bought the helmet and would have liked the mechanism to work better. Overall, a very good helmet and I would recommend it. Like I said in the previous post,I wouldnt wear anything but a arai,or at least a shoei,anything but that is crap, masei is just like the hjc piece of junk I wouldnt recommend it at all. However they are DOT approved and are beautiful so why not right? Masei Helmets are a very good quality helmet with excellent styling and color and graphics selection. Toad's Head Helmets has chosen Masei Helmets as its standard helmet for its helmet integrated brake light and turn signal system (HIBTS) --patent pending. Toad's Head has introduced a indicator lighting system that is mounted in the rider's helmet. Toad's Head chose Masei as its standard helmet for it quality, styling, and selection. Masei has embraced Toad's Head and the two companies have teamed up. Contact Toad at [email protected] for information and to order the Masei Helmet of your choice custom fitted with Toad's Head Helmet's lighting system. Toad's Head can custom fit any helmet and will retro-fit your existing helmet. Check the video clip on you tube. Search toad's head. Watch for toadshead.com to go live on the web very soon.